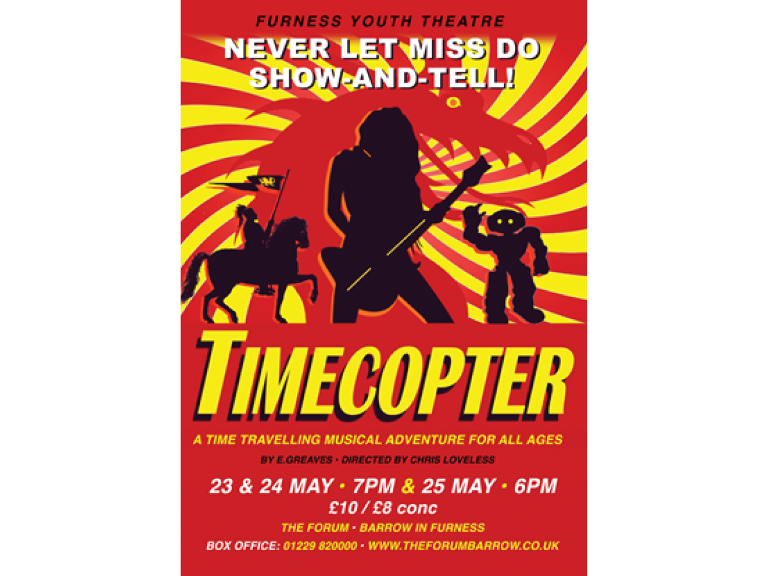 A time travelling musical adventure for all ages at the Forum. Writer, Musical Director, & Choreographer Elisabeth Greaves is a language teacher, science fiction and historical author, and piano and singing tutor. She runs children’s drama and workshops; recent productions include Calamity Jane, Mary Watson and the White Monk Murder, The Frosty Pantomime, and The Pirates of Penzance which played at Ulverston Dickensian Festival. She helped found ACT, now Furness Youth Theatre, as a teenager, arranging and directing music for The Hobbit in 1991. She has been the piano accompanist for FYT since her children joined, as well as accompanying Ulverston Amateur Operatic Society for the last fifteen years. With a Masters degree in history, she is often seen inNorman or Victorian costume, at living history demonstrations with Iron Shepherds Living History. Director Chris Loveless trained at theBristolOldVicTheatreSchool. His productions have played inLondon’s West End, the regions, andNew York, with several named critics’ choice by Time Out and the Evening Standard. Locally, Chris has directed many productions for Furness Youth Theatre and its predecessor ACT Youth Theatre.